Just discovered that PRISM and The Crossing were featured on a December episode of New Sounds with John Schaefer on WNYC. Music by Gavin Bryars, Roshanne Etezady, and Huang Ruo. Have a listen to the podcast! https://www.newsounds.org/story/3873-music-bryars-crossing-prism-quartet/ 2 days 8 hours ago. Today at 3 PM, PRISM's Matthew Levy and composer/pianist Uri Caine are guests on WMBR's New Edge Program with host Ken Field to discuss the Quartet's new release, "The Book of Days." Listen online at https://www.wmbr.org/ or at 88.1 FM if you're in the Cambridge, MA area. 3 days 7 hours ago. ANNOUNCING PRISM Quartet's Residency at Temple University, April 25-26. CALLING ALL SAXOPHONISTS: all residency activities are free and open to saxophonists from throughout the region. https://mailchi.mp/prismquartet/temple?e=[UNIQID] 1 week 3 days ago. PRISM Quartet updated their cover photo. 2 weeks 3 days ago. VIDEO RELEASE of WAVEGUIDE MODEL I: One of PRISM's most adventurous projects, with music by Dan Trueman and interactive video environment by Mark DeChiazza, co-presented with Drexel Westphal College of Media Arts & Design. Special thanks to our principal funder, The Pew Center for Arts & Heritage. 1 month 2 days ago. “The saxophone’s place in the music world is not at all what Adolphe Sax had in mind when he invented the instrument over 150 years ago. Ascendant in the world of jazz, relatively marginal in Sax’s intended field of classical music, and surprisingly adaptable to various forms of non-Western music, the saxophone family is a marvelous accident of musical history,” WNYC’s John Schaefer writes in the liner notes for the PRISM Quartet’s new innova Recordings release, The Singing Gobi Desert. Partnering here with the ensemble Music from China, PRISM presents works by four Chinese-born American composers: Bright Sheng, Lei Liang, Fang Man, and Huang Ruo. The Singing Gobi Desert reveals that saxophones and Chinese instruments have a natural, if unexpected, affinity. From Bright Sheng’s title track to Fang Man’s “Dream of a Hundred Flowers” this music is no simple fusion or mashup, but rather a deep integration of traditions, as reliant on the PRISM Quartet’s extended techniques — flutter-tonguing, multiphonics, breath blasts, and key clicks — as on the composers’ abilities to imagine new sound worlds. For nearly 30 years, PRISM has stood at the vanguard of new music ensembles, commissioning works across a broad spectrum of styles, and demonstrating the saxophone’s versatility. 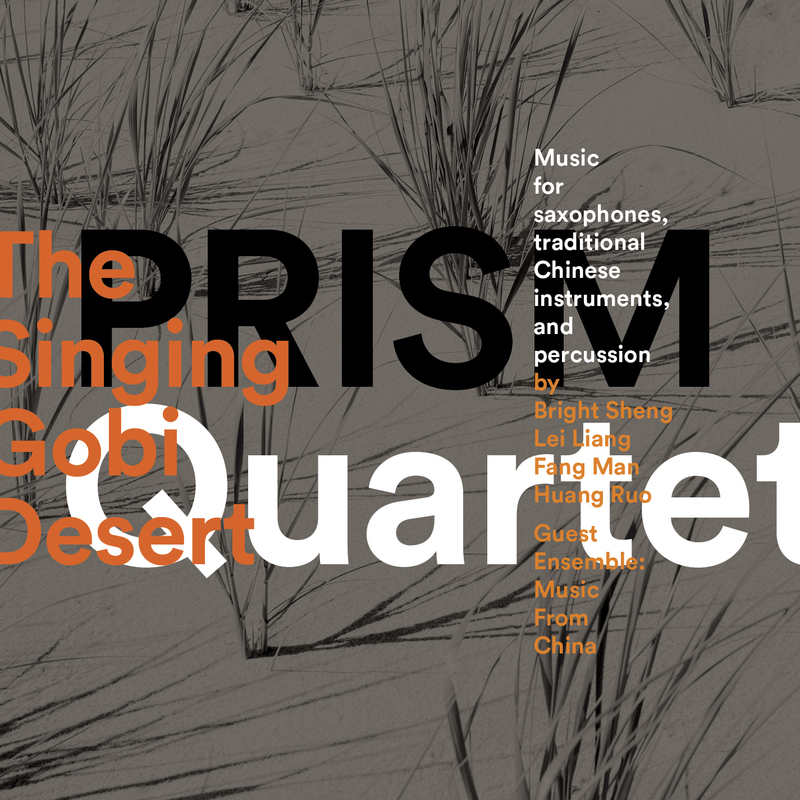 The Singing Gobi Desert embodies PRISM’s commitment to honoring the past and leading the way to the future through relentlessly creative collaboration. "['Singing Gobi Desert" ... is upbeat and enticing, the saxophones providing harmonic groundcover for the piercing strings and the reedy sheng. ... What makes PRISM’s work so successful is that they work as a choir, not forcing the saxophone sound from top to bottom. And from Philadelphia to China they’ve created a remarkable mix." "Although PRISM is already known as a champion of new music, they have outdone themselves with this latest recordings. Not only is the music incredibly stimulating, but the performances are top-notch. The pairing of professional saxophonists with traditional Chinese instruments creates a beautiful blend. ... [B]oth ensembles have created stunning realizations of serious compositions."